The Cadillac North American Snow Festival (NASF) takes place during the first weekend of February every year. In fact it has been held in the picturesque Cadillac area for over 3 decades. There are plenty of outdoor events like the snowmobile races, a polar dip, and an ice-fishing contest bringing you outside to take full advantage of our frozen lakes. The festival hosts an abundance of indoor events as well, like the chili-cookoff, craft beer tasting, and Miss Cadillac NASF pageant are there for those that need a relief from the chilly weather! NASF - North American Snow Festival shared a photo — at Wexford Civic Center. Speed fishing tournament is underway. 25 holes - 25 Fishers rotate. Winner takes all! Temperatures will be up into the mid-30's by the weekend, here we go #NASF2019! NASF - North American Snow Festival shared a post. Hook-laden pop with a kaleidoscopic array of worldly influences, The Ragbirds exhibit a gleeful disregard for contemporary folk-rock convention.The five-piece project is clearly built around the multi-talented Erin Zindle, who is proficient in a variety of stringed instruments. 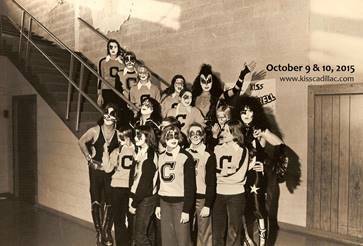 On October 9-10, 2015, Cadillac will celebrate the 40th Anniversary of the KISS Homecoming at Cadillac High School. The legendary rock band KISS visited the small town of Cadillac in 1975 to connect with their football team and perform a concert in the gym, a story that has become iconic in Rock and Roll history. This year’s homecoming coincides with the 120th Anniversary of Cadillac Viking football, so special festivities are being planned. The weekend will include: The homecoming football game, KISS-themed additions to the homecoming parade, a re-creation of the concert in the gym (featuring the World’s Best KISS Tribute Band – Mr. Speed), the unveiling of a permanent KISS monument, walking tours of KISStorical markers at significant spots around town, promotions by local businesses, and much more. The KISS Cadillac Homecoming is a collaborative event with Cadillac Area Festival & Events, Cadillac Area Public Schools, the Cadillac Viking Athletic Boosters, and the Cadillac Band Boosters. All NET proceeds from the event will benefit the two booster clubs. A schedule of events, ticket information for the KISS tribute concert featuring Mr. Speed, sponsorship opportunities, and ways for KISS fans to donate to the monument fund will be announced soon. Continuing information updates will be on the event website at www.kisscadillac.com, on Facebook at https://www.facebook.com/kisscadillac, on Twitter at https://twitter.com/kisscadillac, in the Cadillac News in print and on www.cadillacnews.com, and on www.neffzone.com/kiss. Event details and information about visiting Cadillac will be on the Cadillac Area Visitors Bureau website at www.cadillacmichigan.com. Marhar Snowboards will be on hand Saturday, February 27th. Come out and demo some of their snowboards. Marhar is based out of Grand Rapids, Michigan. Gopherwood welcome Joshua Davis back to our stage. He’s not played here since his success on The Voice. Come welcome him back to Cadillac and enjoy an unbelievable night of music. Join us to enjoy a unique and scenic tour of Northern Michigan in the springtime! Tickets – $25 for adults, $12.50 for children ages 6 to 12, children 6 and under are free. Tickets are available at the Cadillac Area Visitors Bureau, ONLY cash or checks will be accepted. Sale starts Wednesday, April 20th at 9am. Please note, ticket quantities are limited – day of purchases may not be available! Hoxeyville boasts two stages featuring national touring artists, as well as the best and brightest Michigan talent. With an intimate capacity of three thousand and an amazing lineup, 2016 is not to be missed! The site is strategically located near various mountain biking trails and the Pine River—a national wild and scenic river—world class blue-ribbon trout stream and a renowned paddle sports playground. Kestelwoods restaurant, party store and campground is a convenient five minute walk from the festival grounds. Festival entrance opens at 10 a.m. on Friday August 19. Early Bird ticket holders will not be allowed in on Thursday, August 18. No early entry will be allowed, please do not arrive early. You will be charged double the face value ticket price if you are on site without a wristband and possibly charged with trespassing and ejected. No refunds will be issued. This is a rain or shine event. Below are the latest postings from the Hoxeyville Music Festival Page On Facebook. Don't miss Railroad Earth this summer! See you here in August? Here's your chance at two full weekend passes to our June cousin: Camp Greensky Music Festival! Join us here at the peak of summer! 2016 is the 44th year of the 10K, the longest continually running 10K in Michigan. The “festival” will include vendors and live music. Come join us! Below are the latest postings from the Cadillac Festival of Races Page On Facebook. Cadillac Festival of Races shared a post. Putting on the race every year is always a large undertaking. As soon as the race is over, we start working on next year; we have post race meetings to discuss how it went and what we can improve for next year. Than there is a period of relative quiet until January. After that it starts ramping up, planning, organizing, designing... as June and July pass, our intensity increases. Marketing, face book posts, radio interviews and commercials, TV interviews and commercials, soliciting sponsorship, organizing volunteers, designing and ordering race shirts, designing and ordering race swag, such as beer glasses and trophies. Obtaining city permits, getting insurance, road closures, police support, EMT support, music, timing company, and... did I say volunteers? It went off very well again, with a couple hiccups... missing bad weather... now it’s clean up time! It’s amazing how it all comes together! But we could not do it without all of our sponsors and volunteers. I would not be surprised if in the whole organization some 200 people are involved, one way or another! Let’s do it again next year!!! Live Music from the Zak Bunce Project, Delilah DeWylde & the Lost Boys, and our headliners The Crane Wives!! LIMITED TICKET QUANTITIES AVAILABLE! ONLINE TICKETS AVAILABLE MAY 5, 2015. Below are the latest postings from Cadillac’s Craft Beer Festival Page On Facebook. Cadillac&apos;s Craft Beer Festival Cadillac's Craft Beer Festival shared a post. Cadillac&apos;s Craft Beer Festival Cadillac's Craft Beer Festival shared a photo.